Dates facts, an information sheet for kids cooking activities. 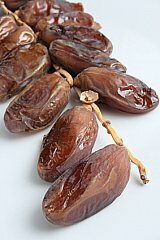 Dates facts and general information about dates. On a palm tree where the weather is very warm. The tree grows tall reaching up to the sun. Dates should be plump. Avoid dates that are hard. Store dates wrapped up in fridge so they dont absorb other odors. They also freeze well. Add chopped dates in cereals, granola bars, cookies, or eat as is. Dates are high in Vitamin C, Iron, Potassium and Fiber. Add cornflakes, oats, dates and bran together in bowl. In separate bowl stir peanut butter, egg whites, sugar and vanilla together until well blended. Pour egg white mixture over cereal mixture and pour into greased 8x11 pan or 13x9. Smooth mixture flat. Bake at 350 degrees about 10 minutes until browned. Let cool and cut into bars. 1 cup tahini (sesame butter)- you can make your own by grinding fresh sesame seeds in a strong blender. Simply mix the three ingredients either in a food processor or by hand. Pat into a pan lined with plastic wrap and cover with plastic wrap. Refrigerate overnight, cut and enjoy! It is sweet and very healthy! Back to Food Facts from Dates Facts.